Growing up in a colonial fortress in the mid-1700s had the usual restrictions and class distinctions. For Marie and Pierre, and Marie’s twin brother, Nic, and her best friend, Elise, the powers that controlled their lives were more than just the threat of English invasion. Nestled in a prime location on Île-Royale, now known as Cape Breton Island, the Fortress of Louisbourg was not only France’s pride and powerful stronghold in the new world, but also the lure that attracted England to conquer it, not once, but twice. Marie and Nic were under the guardianship of their uncle, Claude, a brutal man who never wanted them in the first place and took his hatred and frustration out on the two whenever he had the chance. When Louisbourg first fell in 1745, Marie and Elise were sent to France with the other Louisbourg residents. Her brother, Nic, in the army, was imprisoned in New England. Pierre had escaped and was making a new life for himself in Quebec. With the peace treaty, the English left and the French returned, but not for long. Just long enough for personal strife to enter the foray and make the growing love between Marie and Pierre that much more of a challenge. After the final siege of Louisbourg in 1758, the two escape, though not without further difficulties. Frieda Watt has written an epic historical romance set in the famed and doomed Fortress of Louisbourg during the final years of French dominance in the new world. The Displaced traces the lives of four young people as they struggle to make their lives together in a world fraying at the seams. The setting is well depicted and the reader instantly feels like they are walking the streets of Louisbourg with these four young people, Marie, Nic, Elise and Pierre. The difficulties the residents of Louisbourg faced, during the siege and before and after, is evident as the struggles to survive are paralleled with the attempts to nurture a relationship in a difficult time, under stressful circumstances. This is a heartrending, passionate story, though fictional, about a real place, a real time and a real struggle. A powerful story of love and survival. The Displaced: A Love Story Set in Colonial America by Frieda Watt is about the conflict of war, love, hate, friendship, family, spies, and is mostly the story of Marie and Pierre. Marie and Pierre have been friends since childhood, enjoying doing things that all kids do, not realizing how much they mean to each other and how deep their love for each other really is. This will soon be tested and pushed to unbelievable limits. The era is the mid-1700s and there is war between Britain and France that has been taken across the ocean to North America. Marie and Pierre are thrown into a world they never dreamed possible, having to fight for their lives, their love, their homes, family and country. Pierre is deemed to be a deserter and sent to prison; Marie spends her days in the hospital, caring for the wounded soldiers and the local sick. Pierre is forced to endure much suffering, both physically and mentally. Marie does not know if he is dead or alive. They both face dangerous journeys and must fight to survive and hope that, when the battle is over, they will be alive and together again. I highly recommend The Displaced to all who enjoy reading about the colonial days, the British and French War, love and historical times. The Displaced has something for everyone, and is written with an entertaining plot and characters that soon become your friends. I was pulled into their lives very quickly and found The Displaced to be a story with many elements – all of them good. I could truly feel the pain Marie and Pierre went through, the joy when they were together, the worry when they were apart. Frieda Watt has truly captured the events and characters in a realistic, compassionate, caring and loving way. 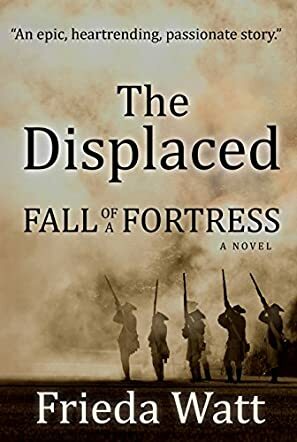 The Displaced: A Love Story Set in Colonial America by Frieda Watt takes us into a time when France and England were often at war and this time it has spilled over to the shores of North America. Marie Levesque is a young woman who is having trouble finding her place in the world. War threatens to take everything away from Marie - from her way of life to her friend, Pierre, a friend that could be so much more if they survive. Follow this gripping story of war, freedom and, of course, love to find out which force is the most powerful. It is no secret that I love good historical fiction, and when you throw in something that is about the colonial times in America, I am even more excited. I went into this book with high hopes of enjoying it and author Frieda Watt did not disappoint at all. Marie is a woman who seems to be a bit out of her time, but I adored that about her. She is strong and knows what she wants without being overpowering. This story has a flow that is well paced and I felt drawn into it from the first chapter. There were a few historical points that did not line up with the research I have done ( I am a history buff, what can I say), but because of how well the story is told I didn't really mind. Historical fiction isn't meant to be a perfect replica of history anyway, so it's easy to overlook that small part while truly enjoying the lives happening on the page. A good love story is always going to leave you with a warm heart and this is a great love story. I don't want to spoil the ending for anyone, but Marie and Pierre truly have to climb some big mountains for their friendship to blossom into love and survive. If you like a good historical fiction and enjoy a romance, then I highly recommend this book. It is going on my reread list and I can't wait to read more from this author.